I'm grateful for Will Eisner and his work and career. I must confess that I've never read a single thing he's written, but if he can inspire the writer that I find the most inspirational and clever and (most importantly) uplifting, then I am certainly grateful to him. I'll try and find "A Contract With God" since you've given it such high praise. Whenever I need to be inspired, my go to choices your "Spectre" series or "Forever Evil Blight". Those two remind me that no matter what, redemption is attainable. Thank you for that! You are incredibly welcome, George. Now go track down a copy of CONTRACT and then let me know what you think! I never liked the idea of Eisner being called a Graphic Novelist. Not for any reason other than they weren't novels, rather a series of vignettes. I think that to call them novels is a disservice, they were really something else unto themselves. Some sort of unique way of storytelling to Eisner himself. The other thing that is fascinating about him is that, with a few exceptions, it always seems like he is telling one long biography of life in the big apple. It isn't chapters, it isn't a series, but rather something else entirely. The best part of Eisner though, is his way of storytelling. Both the art and words are so simple and straightforward... yet elegant. No one loved and respected teh common man, even with all our flaws and sins, as much as Eisner did. This was all really phrased much better in the last one. Honestly I'm surprised you didn't name "The Dreamer" by name. My favorite works of his after Contract are probably the Building and Last Dy in Vietnam. The latter has a bit of Dark comedy in the end that you don't see much in his work. Of course that may not be true,I do have a muh softer spot in my heart for teh Spirit than you do. It is almost like a type of historical writing for the psyche of the eminently post-war American. It was also a bit of a precursor to Man-Thing and Sandman, in the since that he could inject whatever was acing through his mind that week. It was a different Generation of creators, and I dispel, we'll never have a man like him again. "Simple and straightforward...yet elegant." That's exactly right, Jack. There's so much Eisner I love. CONTRACT, THE DREAMER, TO THE HEART OF THE STORM, DROPSIE AVENUE. And on and on. What a body of work he left us. I've never read "Heart of the Storm." Its on the List along with "Fagin the Jew," and either the collection of or actually issues of Will Eisner Quarterly. I have heard him referred to as the "Mark Twain of comics" and the "Orson Welles of comics." While I can certainly see and understand that, I think that it diminishes his own works by having to compare it to others. Perhaps rather Welles is the Eisner of movies. Also, remember this, no one ever drew water better than Eisner. 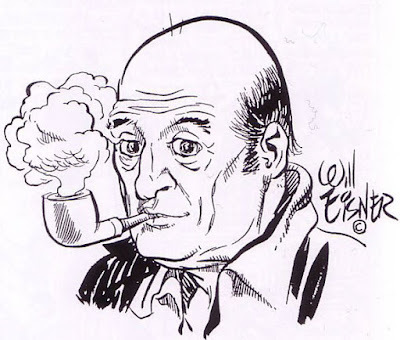 He was a cartoonist in the best and purist meaning of the word. Yes, he was a cartoonist in the purest sense. One man, melding words and images in a unique and truly brilliant way. Those men and woman who can both write AND draw are magical creatures to me. And the comic book medium was made for them. Hard for me to name one person as the greatest of all time, Karlos, but Eisner is certainly up there with Jack Kirby at the top of the mountain. Very true. Mr D - Kirby is sat up there, too! Both men would've been 100 this year, of course. Yes, it is. But we're lucky to have had them!